I see a lot of “niche selection confusion” with the entrepreneurs I work with. This is common, along with using too broad a niche, but the benefits of narrowing your niche are that it will cost you less time and money the more narrow it is. There is a “formula” for this that you can follow that will help you decide. 1) Write down the major keywords that people would search on to find you for the first (or only) niche that you are considering. Don’t worry, you’ll think of more keywords when you do this next step, and suggestions will be provided as well. a) Go to each competitors site and right click anywhere except over images, and look for the word Keywords with a list after it. Only older sties will have this as most all the search engines ignore this now for the simple reason that there can be no correlation between the keywords and the actual content. b) Also search on h1 and see the text they are showing in the biggest type on the page – it should have their main keywords in it. c) You should find their Description tag searching for meta name=”description” and they should have some good keywords in that, too. 2) Go to the Google Keyword Tools (on your Adwords account) and find the least expensive and the most used keyword COMBINATIONS and see where the most money is to be earned for the least investment. This will narrow your market as well as lower your overall costs – not to mention the timesavings. Notice that each group contains a list of keywords that are included in each group category. Marketing Psychology gets more searches, and the competition is low, but the Price Per Click is very high – we don’t want those. Reverse Psychology is not exactly what we are looking for, so that’s out. Selling Techniques is good on all three – good search amount, low competition and fairly low bid price. Psychology of Selling – almost as good a search count, again Low competition and much lower bid price – I think I’ll go with this one AND use the next one, Sales Psychology as well. 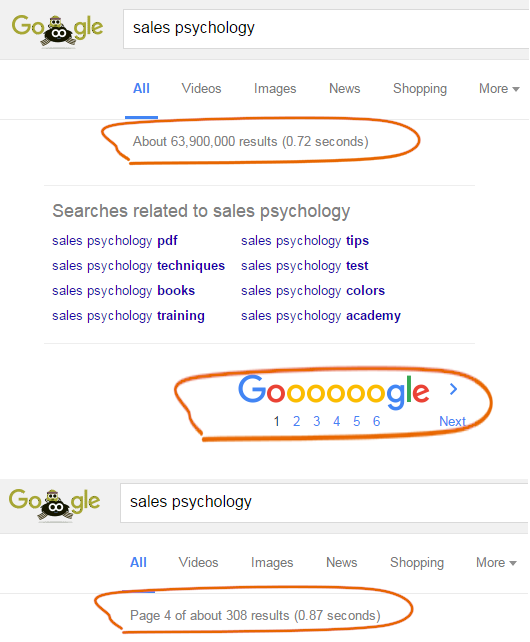 If you were to click to expand these, you would find that some of the most searched keywords is psychology misspelled in different ways – it’s common to include misspellings in your metatags in a case like this. Some of the higher volume searches (not shown) have someone’s name associated with them – also common to use. Then go to Google and search on the keywords to see how many there actually are. Note that the number of initial search results is not a true result. There are many duplicates and other reasons the result count is so high. You find the true result number by going to the last “O” in google, clicking that and then it will go to the last page. So then go back and start all over! Check out your other choices on keywords for that niche and for other niches. Keep track or you’ll get really lost! •	Average monthly searches (“Avg. monthly searches”): The average number of times people have searched for the exact keyword based on the location and Search Network targeting that you’ve selected. By default, we average the number of searches for the term over a 12-month period. •	Competition: The number of advertisers that showed on each keyword relative to all keywords across Google. Note that this data is specific to the location and Search Network targeting that you’ve selected. 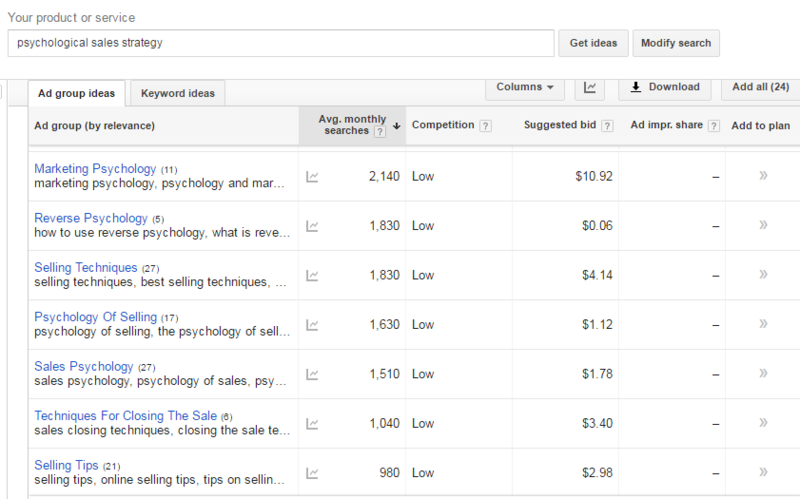 In the “Competition” column, you can see whether the competition for a keyword is low, medium, or high. •	Suggested bid: Your suggested bid is calculated by taking into account the costs-per-click (CPCs) that advertisers are paying for this keyword for the location and Search Network settings you’ve selected. The amount is only a forecast, and your actual cost-per-click may vary. •	Ad impression share: The number of impressions you’ve received divided by the total number of searches for the location and network you’re targeting that matched the keyword exactly in the last calendar month. 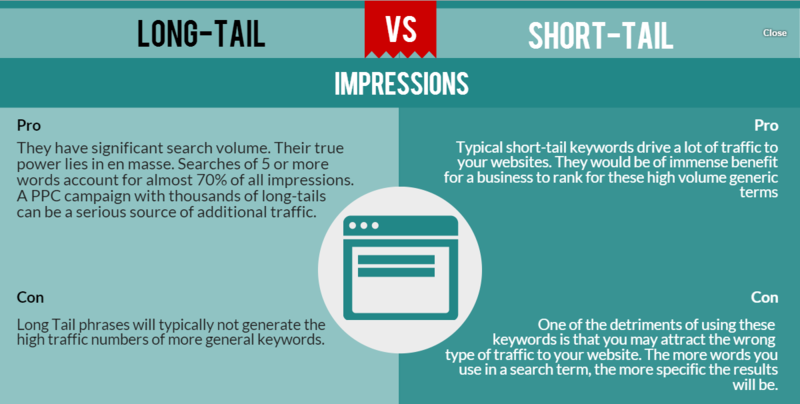 Keep in mind that the ad impression share column in Keyword Planner is different than the impression share and exact match impression share columns in campaign management. They are based on the number of impressions you were eligible to receive for a keyword. In Keyword Planner, ad impression share is based on the search volume for that exact keyword. When you see a dash (-) in the ad impression share column, that means we don’t have enough data to calculate this number. •	Organic impression share (“Organic impr. share”): The percentage of times a listing from your website showed up in web searches for a keyword. This is calculated by dividing the number of web searches that showed a listing from your website by the total number of searches for that keyword idea. •	Organic average position (“Organic avg. position”): This shows how listings from your website rank compared to listings from other websites. This is calculated by taking the average top position of your listing (or multiple listings) for each web search for a particular keyword.